"If it is too good to be true then it is probably untrue." This is what I learned when I almost fell for the Club Ultima / Crown Regency Hotel scam. Last year, I received a call from an unknown number. 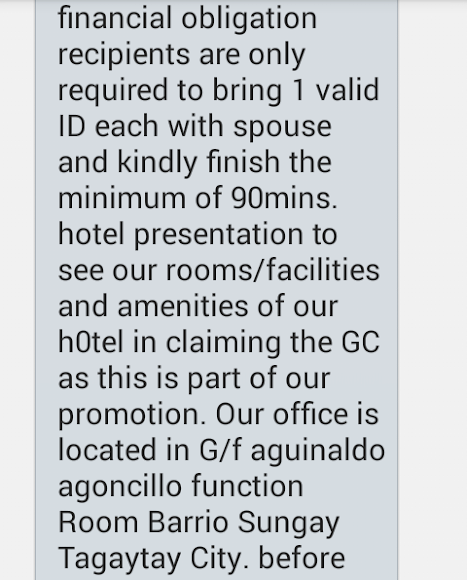 The caller said that I won a free overnight stay in Crown Regency Hotel in Cebu. I can claim the gift certificate by just watching a 90-minute presentation. I smell something fishy so I didn't take the bait. I thought that's the end of it. Last April, I received a call from a certain Andrea Madrigal. 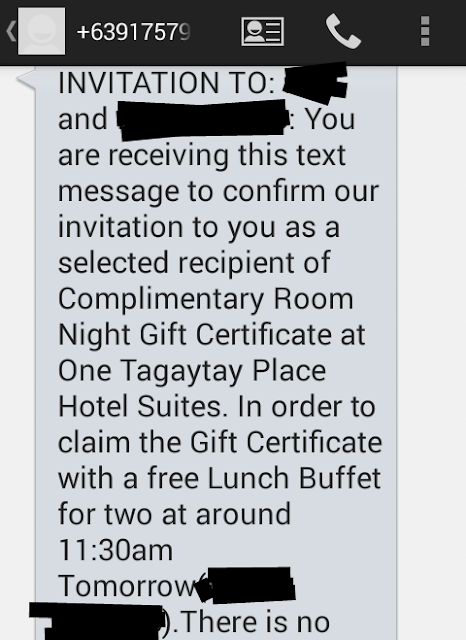 She told me that I won a free overnight stay in One Tagaytay Place Hotel. She also told me that I have to attend a 90-minute presentation to get the free gift certificate. She also promised that there will a free lunch buffet. 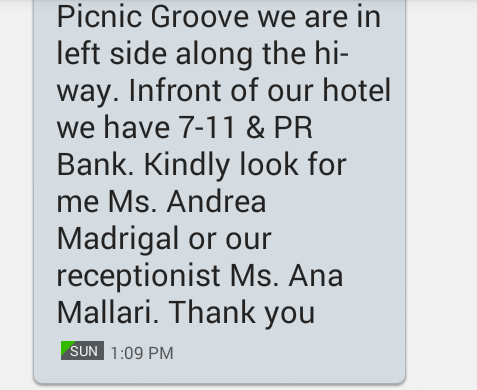 I was suspicious because she used the same script as in the Club Ultima /Crown Regency Hotel Scam but I confirmed my attendance, nonetheless. It will be their pleasure to us indeed since they reeled in another victim. My gut tells me that there is something wrong with the so-called "free" overnight hotel stay so I decided not to attend the 90-minute presentation. Andrea called again the next morning so I apologized and told her that I will not come. Her reply was, "Ano pa ang magagawa ng sorry mo?!" Then she suddenly dropped the call. Her attitude just confirmed that she's a scammer. A true hotel employee will not act the way she did. I bet that she was mad that she will not get a commission because her victim got away. It seems that my name is still in their database so I will not be surprised if I will get another call or text message from another scammer. I am truly thankful that I was not victimized by this One Tagaytay Place Scam. This Andrea think that I will deal with her again after her rudeness. Bah! I didn't reply to her text message. Bahala sila mag-aksaya ng load. I did a Google search about One Tagaytay Place Scam and I discovered that they been doing this for a very long time now. Some says that this is valid but the problem is that these people are exaggerating their claims just to make their prospective client say "yes". That's the problem and that makes it a scam. I get a lot of that, from "banks" usually, via sms and calls and also through emails. Really terrible!!! Have to be very very careful. Yeah! There's no harm on being careful. What was the scam? Did you pay for anything? Andrea did not sell anything but I read a lot of bad things about their scheme. My Husband and I are also a victim of that scam. Since we have a free time and the place is so near..We attended the 90-minute presentation blah--blah--blah. BUT.. it took 2 and 1/2 hour of presentation with no sense at all.. I don't know how we come that far.. but honestly.. the free overnight they are saying is one-big scam. It seems they don't want you to stay at the hotel. The certificate of Over-night stay states : "the reservation fee is Php1,000" So...how come it's FREE. It also states "the overnight stay can be use on Mon-Thurs only.. except Holiday".. Lokohan talaga. I actually read that a couple filed a case against scammers like this. Ewan ko lang kung ano na nangyari sa kaso. kagabi lang po muntik n kami buti nalang wala kami dalang pera, nakapirma po kami meron po kayang legal action doon. Posibleng may gamitin laban sa inyo since may pinirmahan kayo. Naalala nýo po ba kung ano yung nakasulat duon sa dokumentong pinirmahan ninyo? Dapat talaga hindi pinapayagan ng admin ng mga Travel Fairs yung mga ganito eh. Unfortunately, mahihirapan din yung admin na malaman kung sino yung legit or not. Kaya ang siste ko ay hindi na ako sumasali sa pa-raffle kuno sa conventions na pinupuntahan ko. Hindi naman ako nananalo eh. Hello! I just received a call from one tagaytay too! Buti nagresearch po ako so scam pala talaga sila? Tama ka nga. Too good to be true hays! Wow! i received exactly the same text message Oct.28,2017 from a Ms. Faith Garcia. she even called me. me and my girlfriend went to Manila Ocean Park Oct. 27, there were to ladies who handed us out a flier promoting a resort located in Pangasinan, then asked us our names, age, marital status, and if we were employed and our position. *its just nice to know that trusting my gut feeling served me well this time. hopefully no other people falls for this modus operandi. i've read prev post and i can only imagine how bad the experience was for the couple who fell victim and had to be stuck on that presentation for more than 2hrs. nasa ocean park kmi last week july 15 ..nag pilup kmi ng ticket.. then tumawag cy kngina lng around 2 pm... so nagisip talaga aku kung scam cy kc bkit merun cl presentation n 90mins... buti nlng nabasa ko blog n ito..
You are receiving this text message to confirm our invitation to you as a selected recipient of Complimentary Room Night Gift Certificate at One Tagaytay Place Hotel Suites. In order to claim the Gift Certificate with a Free LUNCH Buffet for two,you are only required to bring 1 valid ID each and finish the minimum of 90-mins.hotel presentation for the hotel familiarization,in claiming the GC as this is part of our promotion.(T0M/SUND. July 22,2018 bet.11-130pm.Our office is located in 28TH FLR Unit 2806 ONE CORPORATE CENTER ORTIGAS PASIG CITY, Along Julia Vargas Avenue Cor. Meralco Avenue Ortigas pasig city, Landmark Beside ANTEL GLOBAL ACROSS CALTEX AT The back of the TEKTITE T0WER BENPRES & PHIL. ST0CK EXCHANGE,MEGAMALL. Kindly look for me JESSICA PASCUAL as your reservations officer or Ms.CRISTINE our receptionist. THANKS & GOD BLESS!SEE YOU T0M. Thank you For your candid post. Your feedback is extremely valuable to us. First , We are sorry you had a bad experience over a review. We’ve been in business for almost 10 years, we serve hundreds of customers a week, and we strive to create the best memorable experience for the community. Our entire management is taking this seriously as we speak. May we Also give you an updated feedback that this issue was well resolved last June 8, 2017. We promise to Do better everyday and forward. We hope to hear from you soon. You & your spouse only required to bring 1 valid ID each and finish the minimum of 90-min. hotel presentation for the hotel familiarization. in claiming the GC as this is part of our promotion. Our office is located in E & V Bldg No. 1039 Quirino Highway Corner Dumalay St. Novaliches Quezon City. waaaaah my mom received the same tx msg and shes excited about it. she fiiled out this form in duty free when my dad arrived from abroad and then she entertained the caller also. id better tell this to her. thanks for the info. How po kaya cla mareklamo. Is there any legal action we can do about these scams? Just iN!! !thanks for this review ,Now i know whats this modus all about before i go there and waste my time..pls take action about this bcoz they are still active doing this..
same here. Last May 22, I gassed up at Phoenix Quirino Highway and promo girl from One Tagaytay approached and gave a discount coupon and had me fill up information (name, occupation, email, etc.). I received a call from certain Bobbie (female, I didnt get her supposed surname) saying I was one of the lucky persons to win a complementary stay at One tagaytay hotel. The girl was aggressive and want me to book me for the presentation. I know a scam when I see one because I asked the caller to send to me all information given via email but she said the transactions are only made through phone call. That was a red flag for me so turned down the offer but she was insistent. I blocked her number so she wouldnt call. I am still verifying if the voucher given by the promo girl is legit. IF legit, maybe my information was pulled from said promo that I filled up. Is there anybody here that got scammed of their money? I'm ashamed to say that I have been duped by these people. Has there been an action filed against them? If so, please feel free to post or message here. I'm willing to testify against them if need be. I've just recovered from my horrible experience of them last year, but I am willing to help and see to it that these guys stop duping people and what they are doing. many are commenting about the scams on one tagaytay place botel...but it's not very specific.ur just saying its a scam..but in one way?